It's another recipe from Goldilocks Bakebook, the ingredient measurements of which I tweaked to suit our taste buds. 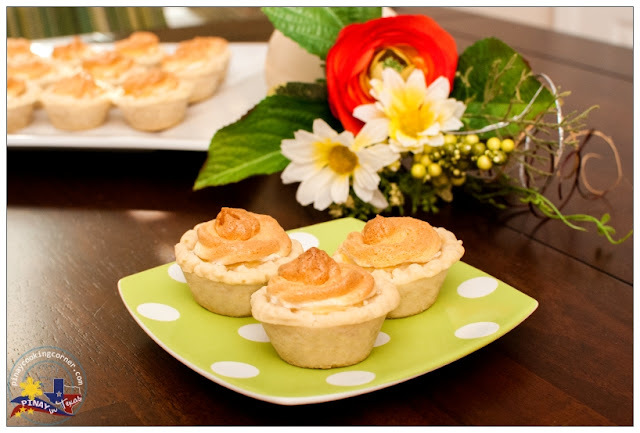 These tarts were made using canned langka (jackfruit), a large fruit native to Asian countries like the Philippines. Ripe jackfruit is sweet and has a distinct flavor and aroma which works well in desserts. Back home, jackfruit is commonly used as an added ingredient in turon (banana roll), halo-halo, saba con yelo and ginataang halo-halo. As a main ingredient, It is used in a Filipino ice cream called langkasuy, which is a combination of langka and kasuy (cashew)...and in langka tarts which were made famous by Goldilocks Bakeshop. I've long been wanting to try making langka tarts and finally I got the chance to do so with my daughters! Though we didn't follow the exact instructions in the bakebook, our langka tarts turned out wonderful. We enjoyed making them and we also had an awesome time eating them! They're so good, I tell yah! 1. 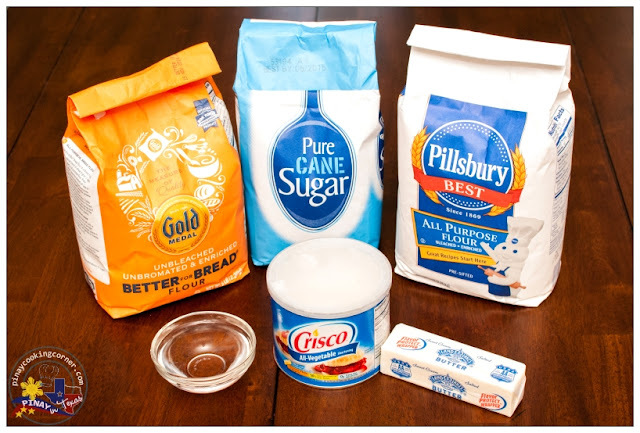 In a bowl, combine bread flour, all purpose flour and sugar. Add shortening and butter. 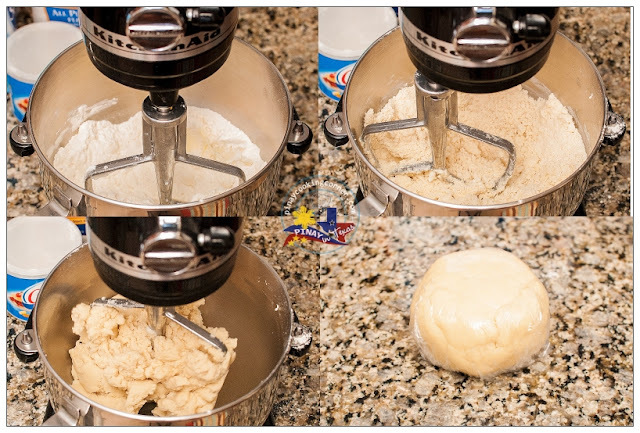 Using a pastry mixer or a stand-alone mixer with flat beater, mix the ingredients until mixture turn into fine crumbs. Add water and continue mixing until it forms into dough. Form into a ball. Wrap in cling film and chill for at least 30 mins. 2. Divide dough into 30 balls, approximately 1 inch in diameter. 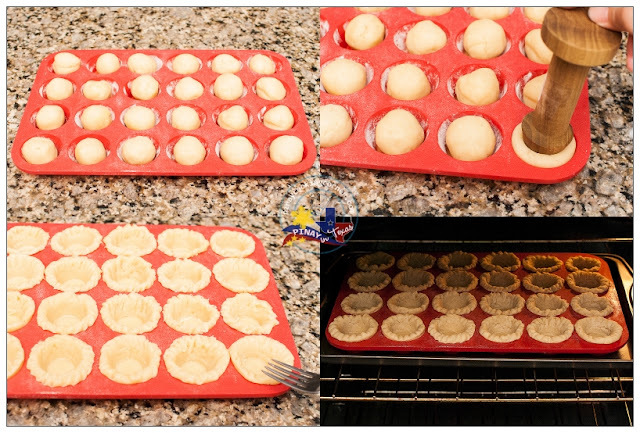 Lightly brush a mini muffin pan with butter and lightly dust with flour. Put a piece of dough into each cup. 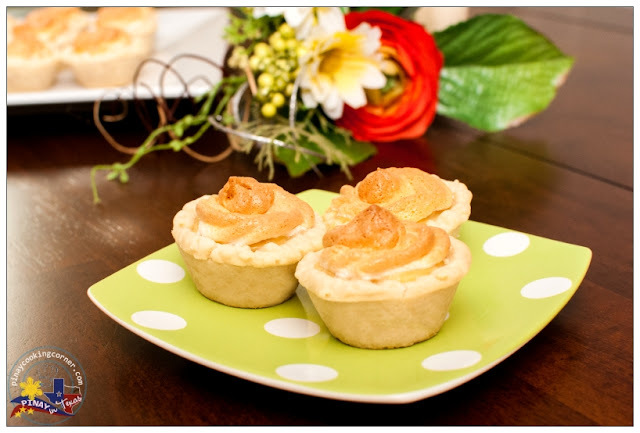 Shape into tarts with your fingers or using a tart tamper. Using a fork, design the edges of the tart shells then prick the bases. Preheat the oven to 350F. Put the muffin pan in the refrigerator while preheating the oven. Bake for 15-18 minutes or until lightly browned. Let cool completely in pan. 1. 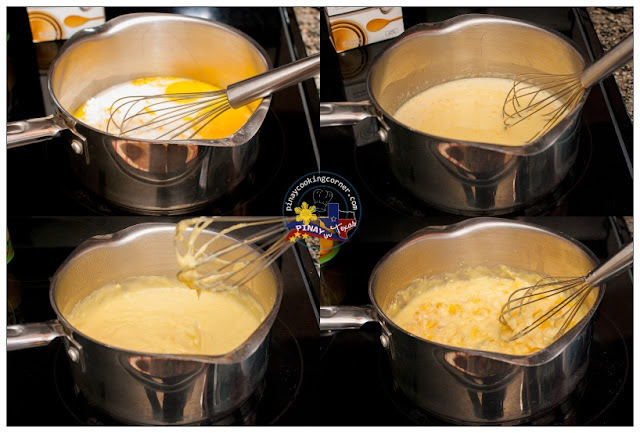 Combine egg yolks, condensed milk, cornstarch and langka syrup in a saucepan. Cook over medium heat with constant stirring for 10 minutes or until it starts to thicken. Reduce heat to low. Add langka and butter and continue cooking for 3 more minutes. 2. Transfer to a bowl and allow to completely cool down. 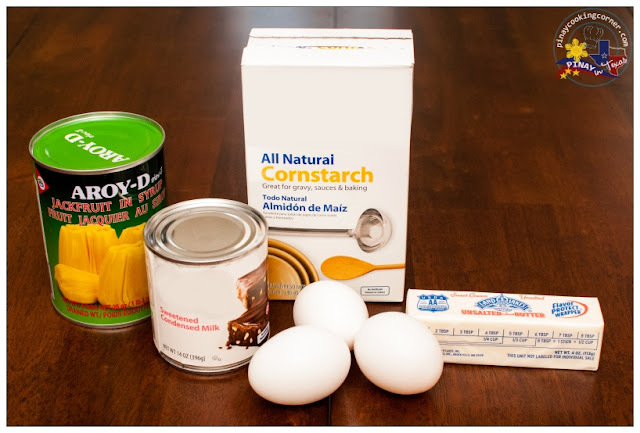 Using an electric mixer, beat the egg white and cream of tartar until soft peaks form. 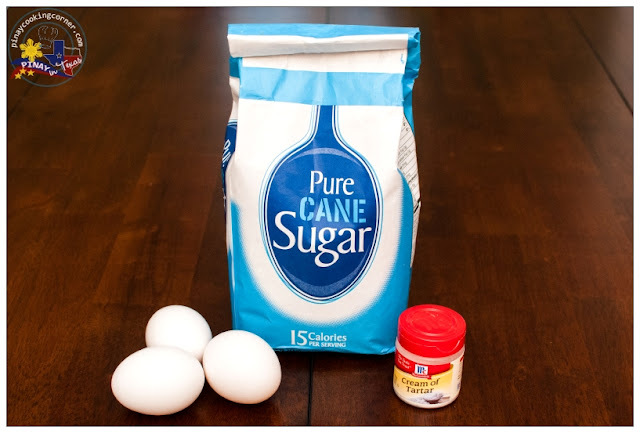 Add the sugar one teaspoon at a time until it is fully incorporated and the meringue is thick and glossy. Preheat a baking sheet in the oven. Once the tart shells and filling have cooled, fill them with the langka mixture just a little below the top of the shells. Then pipe the meringue on top creating a little peak on each as you pipe. 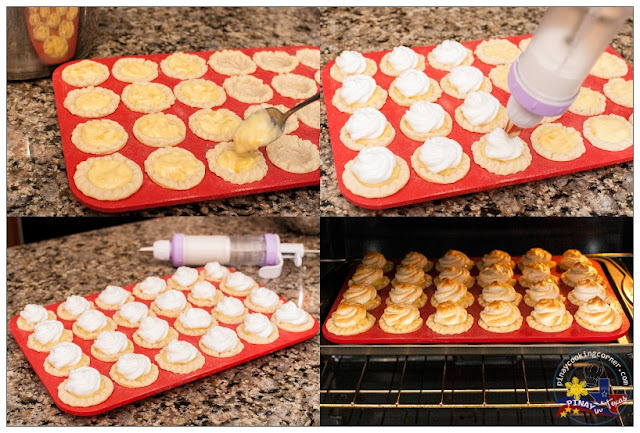 Place the muffin pan on the preheated baking sheet and bake for 12-15 minutes or until the meringue starts to brown. Allow to cool and lift the pies out of the pan using a blunt knife. They look wonderful. That is something I like to do with my daughter too...but I'm not much of a baker. Maybe she'll show me how some day! Hi Tina, wow... my favorite jack fruit. Your meringue tart look so delectable and awesome. Well done, you're an excellent baker. Jackfruit is my favorite Tina, I will try to make with fresh one delicious. Thanks for sharing. Have a nice weekend.